With the departure of his two crewmates to the lunar surface, the CMP had a bigger space to move in and life on board the Apollo command module became somewhat more comfortable. Michael Collins elaborated on this extra space in his autobiography. "I have removed the centre couch and stored it underneath the left one, and this gives the place an entirely different aspect. It opens up a central aisle between the main instrument panel and the lower equipment bay, a pathway which allows me to zip from upper hatch window to lower sextant and return." One reason that Collins created this extra room in the cabin was in case his crewmates returned and found they could not get through the tunnel for whatever reason. All three men would have to don their space suits with the two surface explorers entering through the main hatch, complete with boxes full of rocks. Collins appreciated the extra room he had at present: "In addition to providing more room, these preparations give me the feeling of being a proprietor of a small resort hotel, about to receive the onrush of skiers coming in out of the cold. Everything is prepared for them; it is a happy place, and I couldn't make them more welcome unless I had a fireplace." 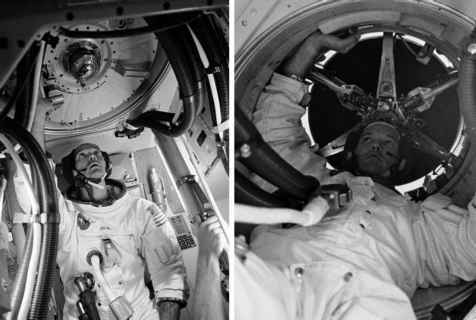 During Apollo 11, the time Collins had alone in the command module was still relatively short, and much of it was spent on housekeeping duties or looking through the sextant in vain to find his colleagues on the surface. He also found that there was very little time available to speak with mission control. Only one communication channel was available between the Moon and Earth through a single Capcom and it was being dominated by the large amount of chit-chat from the guys on the surface as they talked to mission control and to each other. This became somewhat problematic as the needs of the orbiting CSM and its sole occupant vied for time on a link that was already busy with the important task of keeping two men alive and working on the surface of an airless world. Richard Gordon on Apollo 12 had a similar experience, except that he had no problem finding the LM, given Pete Conrad's pinpoint landing. Towards the end of Gordon's time alone in the CSM, he did get to push the science possibilities of the orbiting spacecraft a little when he operated a cluster of four Hasselblad film cameras mounted on a ring, each loaded with black-and-white film and each shooting through a different filter. This cluster was attached to the hatch window and allowed him to photograph the surface in red, green, blue and infrared light. The idea was to carefully detect subtle hue variations across the surface that would relate to the composition of the soil. Telescopic studies had shown that some mare surfaces had a slight reddish tinge while others were bluish. A similar experiment had been attempted on Apollo 8 when Bill Anders photographed the maria through red and blue filters. However, excessively fatigued, Anders had inadvertently installed a magazine of colour film on the camera instead of the black-and-white magazine required by the experiment.